I am no exception; so when I came to know that one of my best friend’s wedding was fixed, I got restless. I decided to step it up a notch from the clichéd sari and salwar kameez. At first I thought I would wear my mom’s Banarsi sari with a stylish blouse but the zari of the pallu had withered away with time. (I would be using the sari for something else so keep watching this space : )). Even 2 days worth of effort was not enough to find something suitable for the reception; whatever I liked was way too expensive. It was time to ransack my wardrobe and I found this old lehenga which my mom had bought for me when I was in 10th Std :).The lehenga had a uncool top and a chunni, so the designer in me 😉 couldn’t help and take over the challenge of giving it a makeover. The fact that lehenga is creamish , gave me room to experiment with colours. I had been longing for an opportunity to wear velvet since long, so I bought a dark blue velvet material(1 meter) for the blouse and decided to go for a red chunni to stir things up a bit. Now what material to use for Chunni was a challenge. 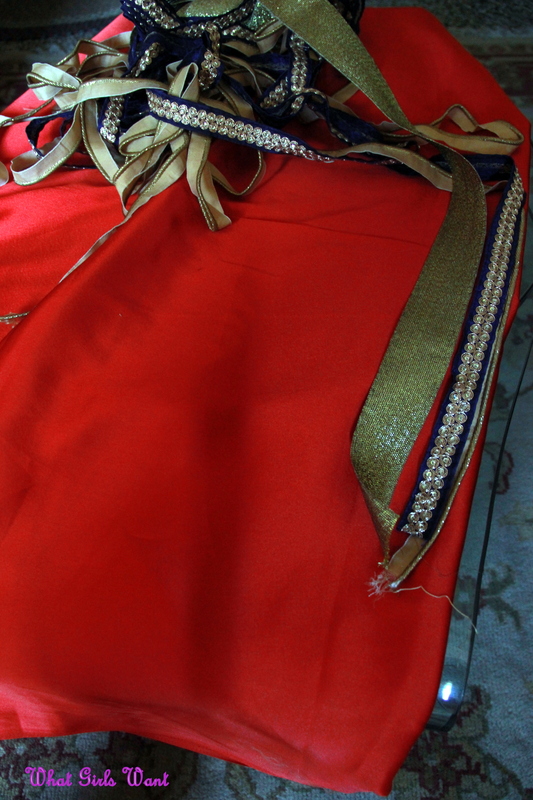 I wanted the chunni to be lively and bright, I saw a lot of materials and finally settled for Satin (2.5 meters). No material could beat the brightness Satin gave. Now the next task was to buy the laces that would go well with the material and the colour I had chosen for the blouse and the chunni. 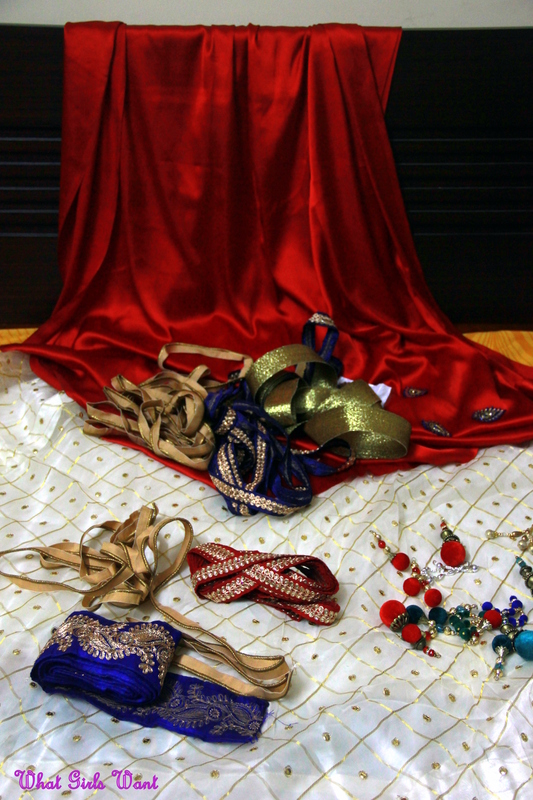 Nowadays the laces for dress materials are easily available in the market so it was not that difficult. Since the blouse was of blue colour I went for a thick border of same colour for the lehenga and a thin red lace to compliment the chunni. For the chunni I settled for a thick golden lace and a thin dark blue lace, golden piping and some dark blue patches with some golden work on them,.Objective was to put it all together so that it complements each other. Lace, for the lehenga and the chunni combined, cost me around 2000 INR.I did all the shopping from Bombay(Bandra and Malad). The next step was to give it for stitching.A good tailor can do magics to your dress and a bad one can completely spoil even the costliest of the clothes. 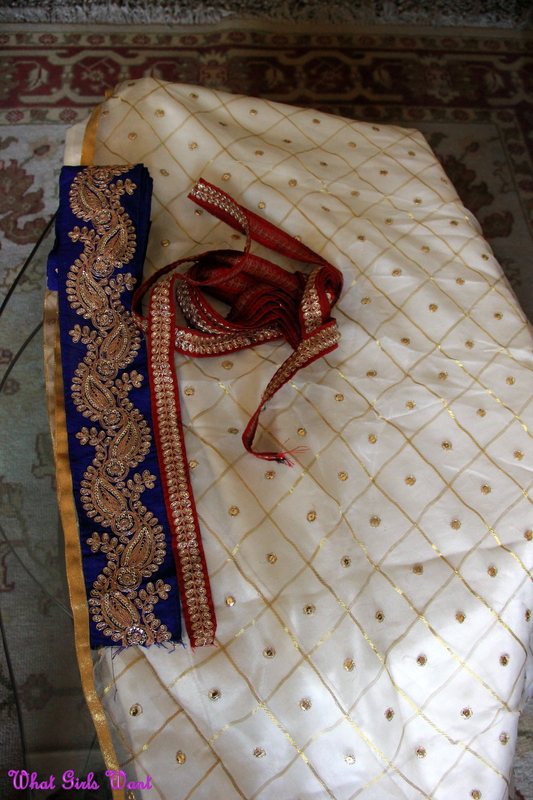 I am lucky to have a good tailor ,in Mumbai, who has been stitching my clothes for over a decade now .I kept the blouse simple so i could reuse it, may be with some other saree.The neck is round with a back bit deep,the dori has red tassels.The lehenga has a golden dori for tying and red tassels too. I wanted the stitching to be neat and the tailor did a pretty good job. On the stitched piece,I stuck the patches myself with fabric glue on the chunni,allowed it to dry off for half an hour and packed it for the wedding.You can add tasselss too at the corners. Trust me it was easier to get this lehenga done than shopping for something new.I bought the material and laces in an hour ,gave it for stitching and done.So go on girls,ransack that wardrobe,get creative and wear designer clothes ;). The result is beautiful! Great job! Hello there I am so delighted I found your site, I really found you by mistake, while I was searching on Yahoo for something else, Anyways I am here now and would just like to say cheers for a incredible post and a all round entertaining blog (I also love the theme/design), I don’t have time to go through it all at the moment but I have bookmarked it and also added in your RSS feeds, so when I have time I will be back to read much more, Please do keep up the superb work. Absolutely lovely. You did a wonderful job! wow, u did an inspiring job!!.. 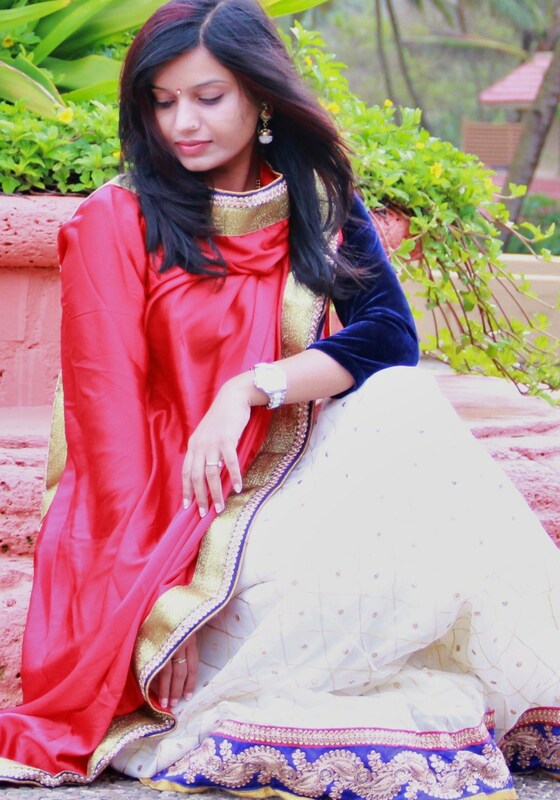 i wanted to make a lehenga out of an old saree of my mom’s…. may ask where did you do your lace shopping from? where in malad and bandra? Thanks a lot…Natraj market in malad and there is a shop opposite to mochas in Bandra Hill road.You can try in santacruz too near the station. Looking forward to that..do share a pic on the facebook page too :)..Happy shopping!! sharing in delicious. And obviously, thanks for yolur sweat! I am so proud of you, even I do such stuff when I have to attend an Indian function, everything that we like is so super costly. I’ll do a post about it sometime for sure, I planned about doing a post about this even when I did not have a blog 😛 And in Delhi, I have found really, like really, good markets for cloth pieces. But the tailor/designer scene is very sad. You have to pay through your nose to get stuff stitched well. The tailor that I go to is not very good fit-wise. I have had horrible experiences with tailors, like I have actually cried in two boutiques!! 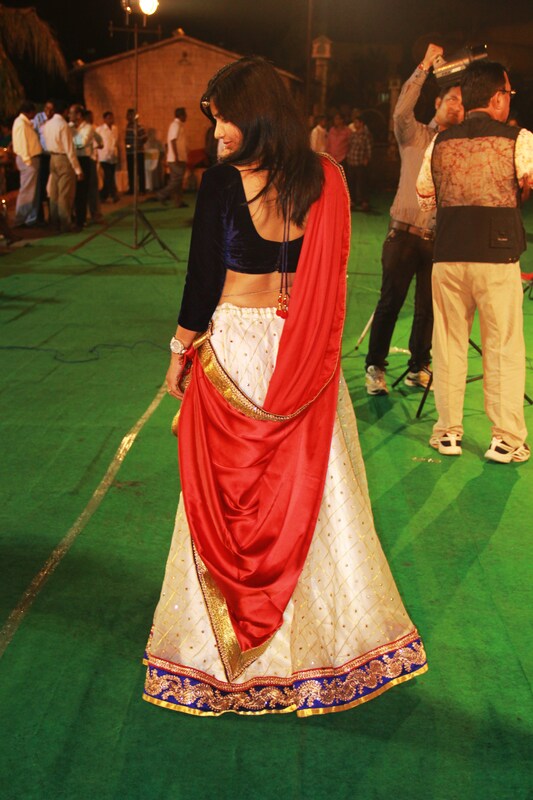 nice… u really made a pretty lehenga.. i wish i also make some changes in my existing lehenga. Thanks a lot..its ver easy..give it a try..
It’s in Thakur complex , Janus boutique , near Gokul heaven . You can take my name(Ila) she knows me . Thank u 😉 will post u if I get anything stitched from her ! Oh my goodness, girl! That. Is. Fabulous! If only I could channel my home interior gift into clothes!